Wow! Thank you so much to the School of Jewelry Arts for setting up such a beautiful exhibition. You really made my day. And, according to what I heard around me, I wasn't the only one to find it fascinating. The installation is about the extraordinary precious objects collected by Prince and Princess Sadduddin Aga Khan. For a period of almost 30 years, he amassed a collection of boxes, clocks and precious objects created by the greatest jewelry houses of Place Vendôme in Paris. His collection features more than 100 boxes created in the 1920s and 1930s. 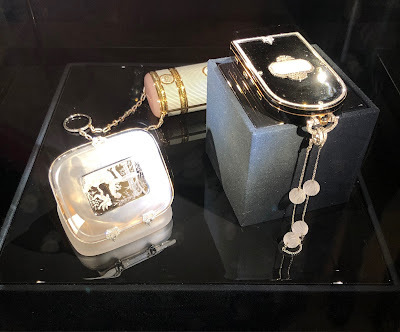 The exhibition presented by the School of Jewelry Arts shows 50 or so pieces from this collection, which captures the essence of the Art Deco style. The precious boxes that make up that collection were amassed for his wife, the Princess Catherine Aleya Beriketti, and represent incredible masterpieces of inventiveness, creativity, fantasy, skills and technical prowess. 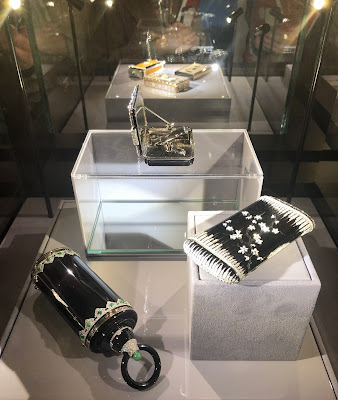 These precious objects, whose craftsmanship was as important as their function, were specially designed for the first wave of ‘liberated’ women in the 1920s: women who smoked, enjoyed going out, applied make-up in public, and kept track of their numerous social engagements with a watch or a clock. Cigarette cases, nécessaires (vanity cases), powder compacts and other precious objects in gold enriched in ornamental or precious stones, adorned with mother-of-pearl, lacquer or translucent enamel, sometimes enhanced with miniatures of Asian or Western inspiration, were presented for the first time in New York at the Cooper Hewitt Museum on the occasion of the exhibition « The Jazz Age: American Style in the 1920s». In this exhibition, they are exhibited in a scenography highlighting the multiple Chinese, Japanese, Persian and European influences on these exceptional Art Deco objects. 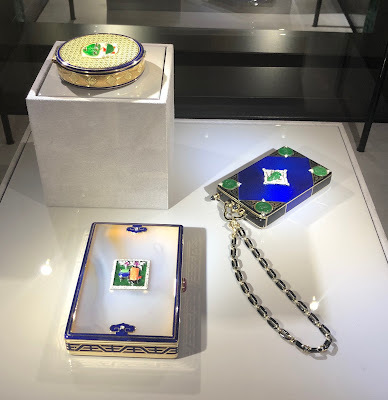 I would like to say a special thank you to the lady from the Van Cleef and Arpels house who gave us so many interesting details about these fascinating and precious objects. Did you know that the minaudière had been invented by Charles Arpels in 1934.